In April 1914 Oskar Barnack, a 35-year-old optical engineer working for the famous LEITZ company in Wetzlar, Germany, proudly completed the first prototype for the Ur-Leica (LEItz CAmera) and applied for a patent. This was the birth of a legendary brand and the beginning of a unique global success story written by a seemingly endless number of technical innovations in the field of optical engineering. Several times LEICA changed the world of photography by introducing revolutionary hardware, opening completely new fields of photography. Over the past ten years WestLicht, the world’s leading auction house for vintage cameras, has sold the most compelling collection of outstanding iconic landmark products, photographs and collectibles including the first commercial camera (a Gireux Daguerréotype built in 1839) as well as the most expensive camera ever (Euro 2,160,000 for a Leica 0-Series built in 1923). Starting with an extremely rare Telescope by Carl Kellner from 1852 to modern rarities, the auction will cover the entire history of Leitz/Leica: the Leica I Mod. 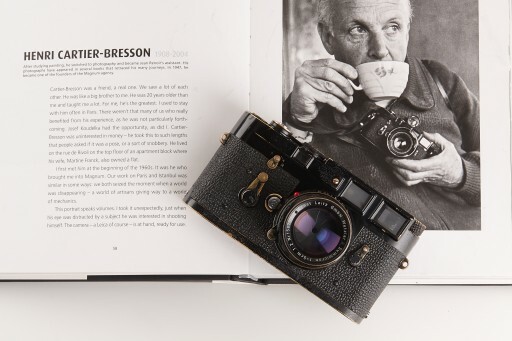 A with Anastigmat (the first commercial model), the original Leica Luxus, a Leica 250 with motordrive, the New York Rifle, a Leica M3 prototype, the black Leica MP, cameras used by famous Magnum photographers (Henri Cartier-Bresson, Rene Burri, Abbas, Bruno Barbey, Elliott Erwitt) will be followed by 100 lots of Leica-related photographs, ranging from original prints from Oskar Barnack’s estate to rare vintage prints by the most famous photographers ever using Leica cameras. On more than 450 pages, the “100 Years of LEICA“ catalogue displays all these contemporary witnesses of LEICA history and therefore can be considered a very complete picture book of LEICA brand development and history, full of exciting surprises, historical details and insider information. Various experts helped and gave their expertise, curated by Lars Netopil for the technical part and Hans-Michael Koetzle for the photographs.